Another successful month of dividend investing into the record books. Being a dividend growth investor provides such a fantastic investing opportunity, allowing one to celebrate small wins, pretty much weekly! This month, dividend income hit a new record high as did my net worth. Gotta love the big pay months! This month I received $1,731.72 in dividend income! On average, I was paid $29.85 from 58 (WOW!) different companies!! This month’s dividend income is a solid 68.48% increase over September 2107. 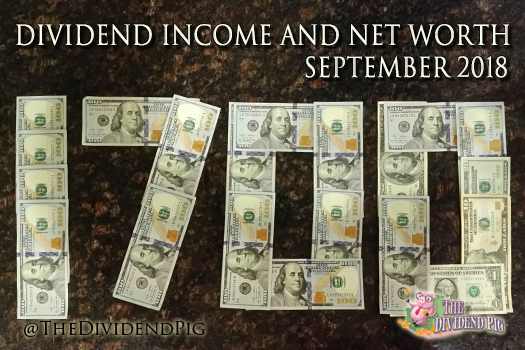 That’s $703.87 more dividend income than last September! This month’s dividend income covers my utilities, groceries, rental property mortgage, internet, cell phone and car insurance for the month… or 1,730 cups of coffee at McDonalds. Here are the realized dividend increases I received this month. Six of my holdings increased their dividends by over 10%! I’m counting on dividend increases to outpace inflation after I retire, so this dividend growth is wonderful to see. September turned out to be an incredible dividend increase month with a total of 13 dividend raises. August’s dividend increases add $72.53 in annual dividend income! Dividend raises are the best! Net worth grew again this month with the market continuing to climb a wall of worry. 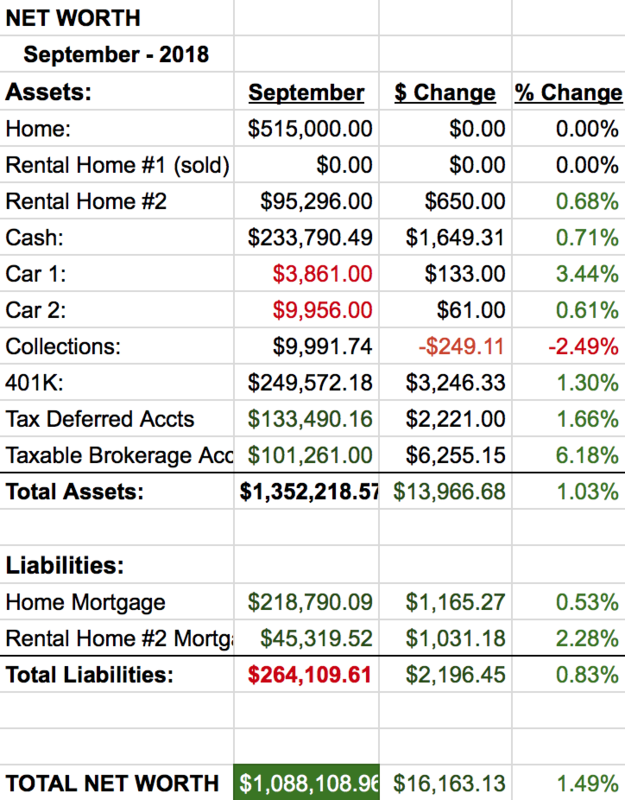 I was able to save a little cash even with a $2,500 deposit into my taxable brokerage account. After last’s months crazy expenses, it’s great to have a “normal” month. I’m still holding a large cash position. The money is sitting in a high yielding money market account with the cash earning 1.85%. Now that the 10yr has jumped well over 3.2%, I might move some of the cash around. Zero problems with the rental property and I received the check on time. No troubles there. My primary home on the other hand is still pending a hearing for a property tax dispute. Hopefully, that will happen soon, and I’ll be able to get that 2k property tax increase rolled back. I’m continuing to look for a new rental property deals in my area. No dice, everything is crazy expensive. Also, while I’m looking for rentals, I’m also looking for options to downsize my home. I’m getting closer to the early retirement date and will need to cash out of this home prior to calling it quits. Once again, everything is crazy expensive. We are considering buying some land and building exactly what we want. A traditionally sized, well built home. However, I’m still investigating if that can be done for a reasonable price. The dividend investing path is not fast and can be some what monotonous. It’s important to celebrate the small win of which I had many this month. My dividend income is growing very well and the dividend growth through raises has been over $75 two months in a row! Fantastic! I’ll keep moving along and I’m sure you will too! Good job to us all! Did you have a dividend income record breaking month as well? Do you have any thoughts on building a home vs buying existing? Thanks for the great update! It’s great motivation to keep looking ahead. I’ve been flirting with $25k net worth for a few months now but Zillow updates on my rental and depreciating my vehicle have kept me just shy. Following your progress keeps me motivated to see those small gains in the dividend portfolio. I know that eventually I’ll see those big #s as long as I stay committed!! Thanks Tim! We all start somewhere, it just takes perseverance. Keep up the good work. Good job. Dont you love how the dividend always goes up and up and up. 58 companies wow thats more than my entire profile. LOL some awesome dividends being brought in. Great YOY also. Then over $72 dollars from dividend reinvestment is awesome. Keep it up. You know it Doug! One of my favorite things is watching the totals rise year over year. What an amazingly broad list of wonderful businesses paying you these nice amounts. I‘d agree, dividend raises are just great, giving the compound effect an incredible boost over time. September was a good month for us as well, our third strongest result of the year (we have a strong exposure to Swiss resp European stocks paying one a year in the second semester. Thanks FS. Glad to hear its not just the USA where real estate prices are crazy! I’m surprised some of these properties every sell (to investors that is), just isn’t any value. I like the 1% rule, and that isn’t going to happen it today’s market. I’m sure the money you are sitting on will find a home soon enough. Thanks for dropping in! WOW! You are on a war path. Also, due to the # of companies you own – you had A LOT of dividend increases this month and that would require quite a bit of capital to deploy to add that. Congrats on cross $1,700, too! after documenting already most other dividend income of our fellows, I knew you’re going to have record dividend income, too. You did not disappoint me – well done! Ha, thanks Torsten! Also, thank you for your hard work in maintaining the income heroes resource!